LET’S TALK GRAVITATIONAL WAVES, BLACK HOLES, WORMHOLES, DARK MATTER AND TIME TRAVEL. 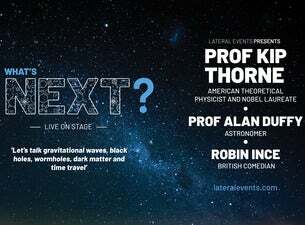 Lateral Events is delighted that American Nobel Prize-winning theoretical physicist Professor Kip Thorne has accepted our invitation to travel to Australia to lead an eminent panel discussion delving into how scientific advances will change how we live our lives and how the world we live in will change for ever. What’s NEXT? is a series of live shows that brings the brightest and most articulate scientific, innovative and comedic minds together to discuss what’s next in science, technology and engineering. Kip Thorne will discuss the area of his Nobel Prize work: the past, present and future of gravitational wave research and multi-messenger astronomy, their remarkable technology, and their future impact on human understanding of the universe in which we live. Joining Kip Thorne will be astronomer Professor Alan Duffy and Robin Ince, co-host of The Infinite Monkey Cage and award-winning British comedian. Prof Kip Thorne is an American theoretical physicist and Nobel laureate, known for his contributions in gravitational physics and astrophysics. A long-time friend of Stephen Hawking and Carl Sagan, he was one of the leading experts on the astrophysical implications of Einstein’s general theory of relativity. Initially, Thorne said, he never believed he would live to see technology that could reliably detect gravitational waves. He expressed scepticism in a textbook he was writing on Albert Einstein’s general relativity when MIT physicist Ray Weiss proposed a method of observing gravitational waves with laser interferometry. In 2017 Prof Thorne was awarded the Nobel Prize in Physics, along with Rainer Weiss and Barry C Barish, “for decisive contributions to the LIGO detector and the observations of gravitational waves. Professor Alan Duffy is a Research Fellow and Associate Professor at Swinburne University and Lead Scientist at The Royal Institution of Australia (RiAus). He is a professional astrophysicist creating universes on supercomputers to understand how galaxies form and to probe the nature of dark matter. Prof Duffy is a of SABRE, the world’s first dark matter detector in the Southern Hemisphere, based at the bottom of a gold mine at SUPL (Stanwell Underground Physics Laboratory) in Victoria.